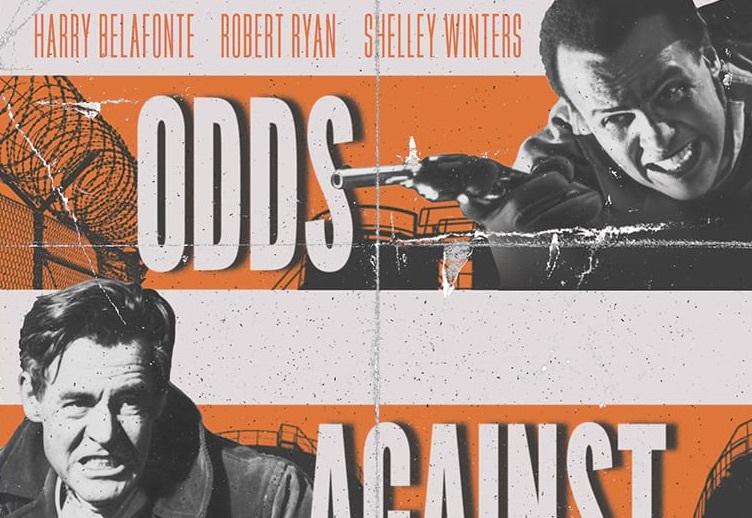 Adam takes a cold and calculated look at the racially charged crime thriller Odds Against Tomorrow starring Harry Belafonte, Robert Ryan, and Shelly Winters. New to Blu-Ray from Olive Films. Gritty isn’t the defining characteristic in Robert Wise’s career as a director. Odds Against Tomorrow is, not a notable exception, in fact, his filmography is filled with Film Noir entries. Here Wise manages to bridge his careers as a “socially conscious” director and the type of populist entertainment that has always been his expertise. The film finds Earl Slater (Robert Ryan) an ex-con racist hustler pairing with Johnny Ingram (Harry Belafonte) a black Musician with a bad gambling habit. They’re brought together by Burke (Ed Bagley) a disgraced ex-Cop. Burke entices the men with an “Easy Job” worth $50,000. It’s enough money to solve each of the three’s problems. But as is the case with any “Easy Job” in film noir… nothing is easy. Rather than it being about said “Easy Job”, Odds Against Tomorrow focuses on the two men hired into the job and their personal lives and struggles. Wise shows compassion for each man and their respective needs for a new lease on life. As much as Ryan’s Slater is a vile racist, his life is more complicated by his time in prison fractured ego unable to do anything of substance. Relying on the compassion of his girlfriend (Shelly Winters in a beautifully modulated performance) and unable to allow himself to do so. Or Belfonte’s Ingram who though charming unable to move out of his own way. Gambling having taken Ingram so badly, and similar to Slater unable to put aside his ego for his own good. How Wise and screenwriter Abraham Polonsky and Nelson Gidding make these men’s struggles with is the crux and broken soul of the film. The script raises this film above the normal criminal undertakings of the genre. The film is more a searing character drama within the confines of a crime film rather than the other way around. The screenwriters adapting from the William P. McGivern novel have concocted a story more socially aware than exploitative in nature. By its bleak ending has played out, one understands that Wise, Polonsky, and Gidding were never concerned with the crime or any of the conventions inherent within. Odds Against Tomorrow uses the genre to show us these stereotypes are life and blood characters. The results are as electric as even the best formulaic crime film. In a way, this stands as a companion piece to The Day the Earth Stood Still. Where Day saw the good in the world, Odds Against Tomorrow sees nothing of the sort. Olive Films has produced a beautiful transfer. The Black and White photography is razor sharp with a beautiful sheen of grain giving it a sort of Archival Print feel that only the best catalog titles have. Odds Against Tomorrow is a searing almost perfect character study of Men under pressure. Recommended.